I need to make one correction to my post earlier today about Wednesday......the gentleman who came out to pump out the bad fuel was Russ from Space Coast Oil. Mike from Trident referred me to Russ. Russ showed up promptly at 9 am as promised with three 50 gallon barrels to put the bad fuel in. It took about 30 minutes to pump out the 100 gallons of half and half. Once that was done, and I had transferred $150 to him for his services, I began pouring the new diesel into the tank. This tank has NEVER been empty since I have owned the Newell. I think the lowest level of fuel was around 45 gallons. Today I started from scratch, but that's really a good thing. I learned two important things as a result of this mishap.....1) I don't have fungus in my tank, which is a b**ch to get rid of, and 2) If I had any water in my fuel it is no longer there.....any water there may have been has been removed by Russ! After pouring in the 12 gallons of good diesel I had, I drove over to Race Trac to get 15 more gallons. That was the easy part.....holding those 5 gallon gas cans for up to 10 minutes turns your arms into wet noodles. I had to ask TLE to come out for the last 3 to help hold them. My wife is the most amazing partner anyone could ever have. Whenever I need help outside she drops whatever she is going and comes to my rescue over and over again, and this time was no exception. Finally the fuel was in...around 27 gallons. Now it was time to re-prime the filters with good diesel, and then turn over the big Detroit Diesel. This is the part I had been concerned about. I went inside to turn over the engine, and she purred to life instantly, and ran silky smooth. I let her run for about 10 minutes to be sure there would be no repeat of the day before, and there was not. Once I was sure we were good to go we finished putting our stuff inside and out, including the T-Bird....we were on our way over to the same Race Trac around Noon to fill up the tank all the way. In total we put in 166 gallons, so there must have still been around 14 gallons floating around in there somewhere as our tank is 180 gallons. At any rate, the total cost to refill was $632....so we have paid the rent twice this month. The good news is based our "written in Jello" travel plans we won't have to fill up again until April sometime. I'll recap the rest of Thursday tomorrow morning with my usual blog post. Wednesday was moving day.....we started getting ready to leave around 8 am, and were ready to hit the road around 10 am....right on time! We bid Ernie "until next time"....who is coming down with a bad cold so no hugs were exchanged. We got on I-95 and headed north toward Melbourne.....we stopped at the Flying J at exit 131 off I-95 to get propane and a $100 of diesel....it was $4.29/ gallon there so we wanted enough to get our tank above 1/4 and then head up to Melbourne where we were going to spend the night, and Gas Buddy showed a good diesel price in town at $3.95/ gallon.....not bad right now. By the way, the propane only cost $3.09 per gallon at Flying J. We arrived in Melbourne around 12:30 and headed to the station shown on Gas Buddy with the $3.95/ gallon price. 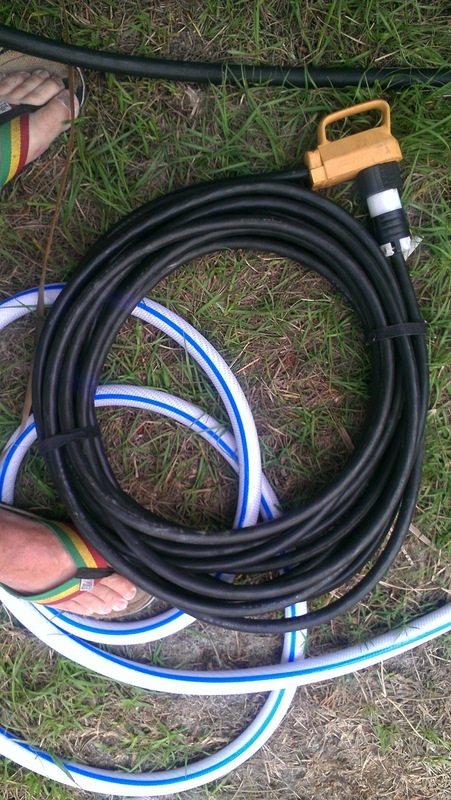 We spied the green handled pumps and pulled in. Right away I noticed the price on the green handled pump was 4.09....much higher than the reported price, so I decided just to get $200 worth, which would put us up over 1/2 tank and then look for a better price on our way up to St. Augustine. The higher significantly higher price than reported should have been a warning flag, but I missed it completely. We finished fueling and headed back down the street to the Lowe's to park for the day. We planned to have lunch with friends, and spend the afternoon with them. About a mile down at a stop light the engine stopped. I've never had that happen before. It did restart, so we continued down the road. About a mile later at a stop light it stopped again.....hmmmmm....did I get bad diesel? As we were pulling into the Lowe's parking lot the engine died again, this time for good. Fortunately it was a slight down hill and we were able to coast to a stop in a decent parking position. The engine would turn over, but not fire. I got on the phone with Good Sam ERS and talked with a representative who said he would find a mobile mechanic in the area who could come out.....at this point I was thinking bad fuel....maybe clogged fuel filters. 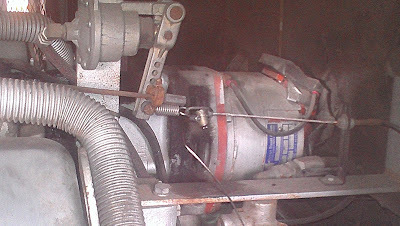 I then contacted our friends to tell them we would be available for lunch.....Chris suggested they come over, bring some diesel so we could change out the filters (I have two extra sets) and see if that was the problem. So they came, and we changed the filters, primed the news ones and screwed them back in place. The DD fired right up and ran for about 5 minutes, then shut down again sputtering. At this point Chris suggested I call the gas station and find out when they last filled their diesel tank, and had anyone else complained. I called and explained to the young lady who answered what had happened after I bought diesel at their station......she replied "Sir, we don't sell diesel here"
I was stunned...I had just been there and used the green handled nozzle....she again emphatically said they did not sell diesel at that station......all of a sudden the realization hit both Chris and I.....I had put in 50 gallons of their mid range unleaded gas in my tank.....they apparently use green nozzles for that grade......doh! Now I have 100 gallons of waste. Shortly thereafter the mobile mechanic arrived. I told him what the problem was. 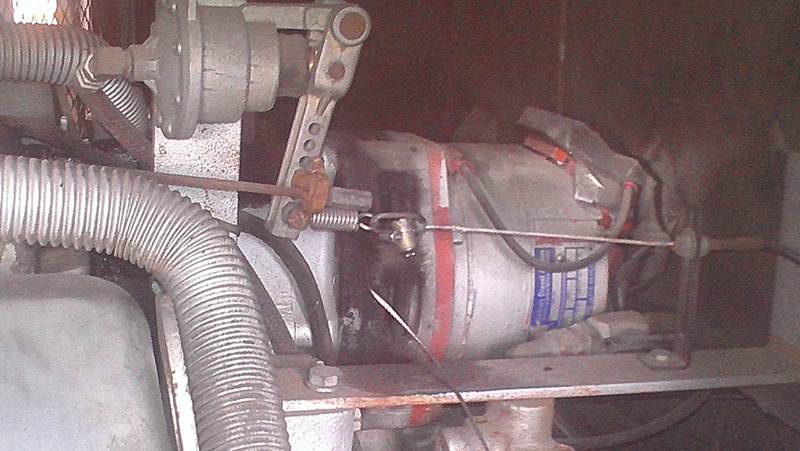 We needed to get the bad fuel out, and he was not equipped for something like that....there is 100 gallons to remove. Chris (Technomadia) suggested (seeing a trend here?) I call a local marina to get a referral for a mobile marine mechanic....he felt they must have to do this kind of thing a lot with boats sitting for a long time and the fuel goes bad, or something. So I did that and got a referral to a guy who referred me Mike at Trident Oil Disposal who has a waste oil truck which can pump out the fuel and dispose of it. I could have gotten the fuel out, but what am I going to do with twenty 5 gallon cans of bad fuel? On top of that I would have to buy 20 gas cans at $15 to $20 per pop...cheaper to have someone properly equipped come and remove it. So, Mike will be here this morning (Thursday) at 9 am to pump out the bad fuel, then we will put about 30 gallons of good fuel in so we can drive to a station that actually sells diesel and fill up......a $400 lesson (just for the fuel....the pump out will cost $150....drive time, plus labor, plus disposal of the bad fuel). I also talked to my mechanic at Choo Choo Express Garage and Don told me I shouldn't have any engine damage with only a few miles driven. 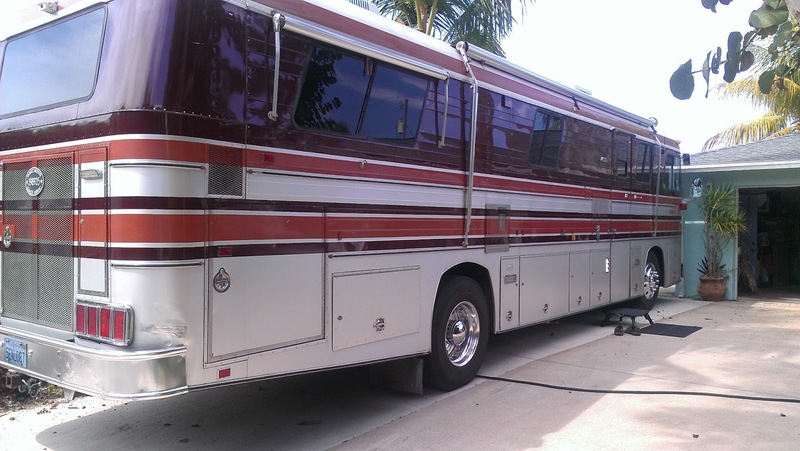 He said he had a driver of one of his tour buses drive a long way on bad fuel, and he put another 300,000 miles on it after that without a problem. I felt if I could get out half, 50 gallons, I could add 3 quarts of ATF, or 3 quarts of 30 weight oil to neutralize the gas, and then fill up with good diesel, but I feel more comfortable taking it all out. 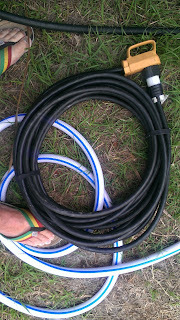 After all the price is the same to pump 100 gallons, or 50 gallons out, so an easy choice there. I'll update later today after we have gotten the bad fuel out, and the good in.......always be sure to read what the pump says....don't go by the color of the nozzle. Part of my problem was I was expecting them to have diesel based on Gas Buddy, so didn't pay attention.....big mistake. After we had resolved how to solve my mistake we walked across the street to a local Mexican restaurant for dinner, and I sat there taking gentle jibes from Chris, Cherie and TLE about my bonehead mistake. Laughter is the best medicine, and I have mostly gotten over the $500+ I just figuratively flushed down the toilet. If that's the worst that happens on our journey I'll be fine. It was comforting to have good friends here while we were sorting out what to do....Chris had a lot of good ideas, and I am thankful for his input yesterday. He got me focused on solving the problem. On top of that we had a nice place to park overnight.....there is a nice pond right next door to the part of the parking lot we are in. TLE doesn't think these look like mug shots....well, she's probably right about hers, but mine looks close. I have never had a passport, and TLE had one back in the 60's, but never renewed it. She went to England for a track meet (she won all her events, by the way), so she got one then, but it's been over 40 years since it expired. We had planned to get this done before we left on our travels over a year ago, but just never got around to it. It's probably that "jello" thing.....you know, as in "plans written in".......we just were not sure when we would need them, so we kept procrastinating. Well, it looks like we'll be entering Canada some time in late June, or early July this year. Our only near term plans are a Newell rally in the Black Hills of South Dakota June 22-29. One of our Newell friends who will be attending that rally has suggested we drive up to Calgary, Alberta, Canada for the "Stampede", and to just do some site seeing......Banff, and Lake Louise are not far. Another Newell friend who lives in Canada and is camp hosting in an RV park in that area has secured three RV sites for us in his park for that week (a third Newell friend will be joining us)! So, finally, Tuesday we had our paperwork completed, and printed along with our certified copies of our birth certificates, copies of our drivers licences, front and back, and SS cards. We had an appointment at the Ft. Pierce main Post Office at 11 am to get pictures taken, pay our fees, and file the paperwork......BUT we got a call from the post office about 10 am advising the Passport lady was sick, but referring us to the Martin County Courthouse right here in Stuart who take "walk ins". TLE called to verify they did, and also that they could take the pictures....the answer to both questions was in the affirmative, so we headed right over. Apparently getting there in the morning is the right time to go as there was no line, and we were promptly taken care of by the court clerk. The pictures above will appear on our U.S. Passports. So, in 4-6 weeks we should have our Passports. You may be wondering why we have to have Passports to enter Canada......well, we don't. It is our government that requires us to have a Passport to re-enter the United States from Canada. It wasn't that many years ago that you could enter Canada, and return to the U.S. with just a drivers license.....I did it twice back in the early 2000's (2000 and 2001), but then 9/11 happened. After that task was completed we drove over to the Supercuts on Federal Highway to get haircuts......yes, that is plural. I got my hair cut last April at this same store. My last haircut in Ocala about 3 weeks ago did not last the usual 4-5 weeks for me.....the top was just getting too long. TLE needed a trim, so she took a seat right next to me. She's gotten her hair trimmed/cut 3 times now at Supercuts, and she has only been pleased with the result once.......the once was not this time. It looks good to me, but what do I know, huh? I've been going to Supercuts since 1984, and in all those years have only had one haircut I was unhappy with......April of 2009 in east Texas. Below you can see the results, and judge for yourself.....it was a little breezy at the Manatee Island Grill, so don't let that influence your opinion of TLE's hair. I'm really getting to like "Shock Top"
After all that "work" we were hungry so we decided to try out a local restaurant in Port Salerno we had not tried before......Manatee Island Grill. 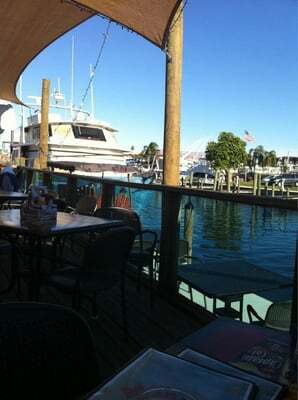 What a nice place, right on the water, and the food and service were great. It was nice to just sit and talk by ourselves. We have loved visiting so many great friends the past month, but have missed just being by ourselves. Later in the afternoon around 4 Ernie and I went over to the Stuart Shooting Center to shoot some of his guns. One, an H&R .22 caliber 9 shot pistol his grandfather bought him the day he was born, was fun to shoot. Ernie was able to hit the target at 75 feet with it.....me, not so much, but I did okay at 30 feet. This is the target from 30 feet....the two in the red are Ernie's....I had 4, or 5 in the vicinity. Not bad for a 65 year old gun. We got back "home" around 6, and since we had a late lunch we just snacked on chips and salsa for "dinner", then settled in to watch NCIS and NCIS L.A. Both were great shows, as usual. Wednesday is another moving day, and another round of "until next times"....we'll be moving up the coast to St. Augustine for 4, or 5 days, but on the way we may overnight near Melbourne....we're hoping to hook up with Chris and Cherie for lunch there. If we can get the nearby Lowe's to let us park overnight we'll do that.....if not then we'll head up to Daytona to the Cracker Barrel where we overnighted last year. In Florida there is no gun registration. In Florida you can obtain a permit to carry a concealed weapon pretty routinely. State sales tax is 6%, and there is no income tax. The cost of living is less than California where the state sales tax is around 8%, or higher depending on which county you live in. There is close to a 10% income tax depending on your income bracket. It is almost impossible to get a concealed gun permit, and there is gun registration. If you don't own guns, or have an interest in them you would never know that there is a serious ammunition shortage in this country right now. Those who do own firearms are purchasing ammunition faster than the manufacturers can put it out. Guns and ammo are flying off the shelves at a record pace. I suppose this is a reaction in some part, if not completely, to the current debate about the 2nd amendment, and how far governments can, and will go toward restricting the ownership of firearms. We visited the local gun store again around 10 am. Apparently in Florida concealed gun permits are handled by the State Department of Agriculture, Licensing Division. I know, I had the same question......why the Department of Agriculture? No doubt there is some govermental logic to that, but it escapes me. We were surprised to learn how many people in Florida are applying for concealed gun permits.....you have to make an appointment about 2 months in advance just to apply. Even this gun shop was low on ammunition. Our friends, Ernie and Carol, suggested we drive down to West Palm beach for lunch to do a little site seeing, and have lunch so we left around 11 am and headed south on I-95. We stopped at the local Tiki Bar for a quick lunch. Yelp gives it a 3, but I would give it a 2.5.....meager bottled beer selection, no draft beer, and average food, but the company and view more than made up for that. We drove around town for a while after lunch and then headed back north to Stuart. We have been giving a lot of thought to changing our state residency, and are currently looking at several states as possibilities. Florida has risen up pretty high on the list in the past 2 months we have been here. Ideally the state we choose will not have state income tax, but that does not rule out states that have state income tax, but no sales tax, such as Oregon. We talked extensively with Chris and Cherie (Technomadia) about our situation when we were in Cedar Key and decided at the time to not make a decision yet. Well, Wednesday is moving day....we'll be moving up the coast to Melbourne where we will hook up with Chris and Cherie for a day, then up to St. Augustine for a few days. We had a nice farewell dinner with Carol, then she left to drive back up to Vero Beach for work. We finished off the evening watching the 2nd part of the latest Castle episode with Ernie....a lot of new plot twists were introduced in this episode. 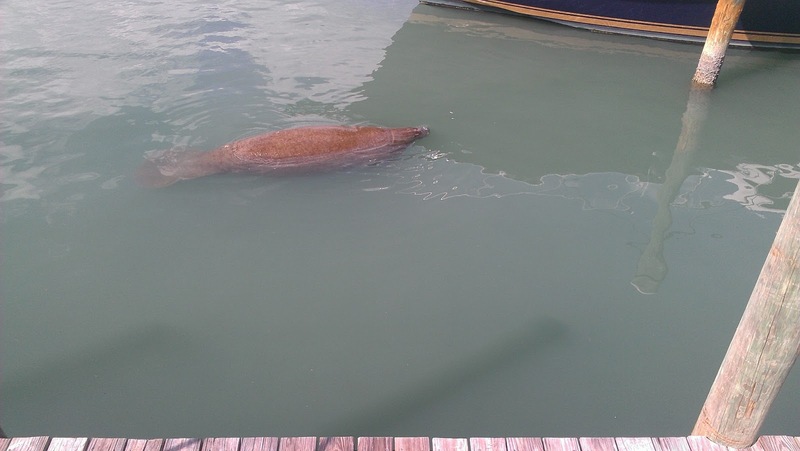 As soon as I write about seeing manatees every day since we've been in Stuart..........we don't see any at all. 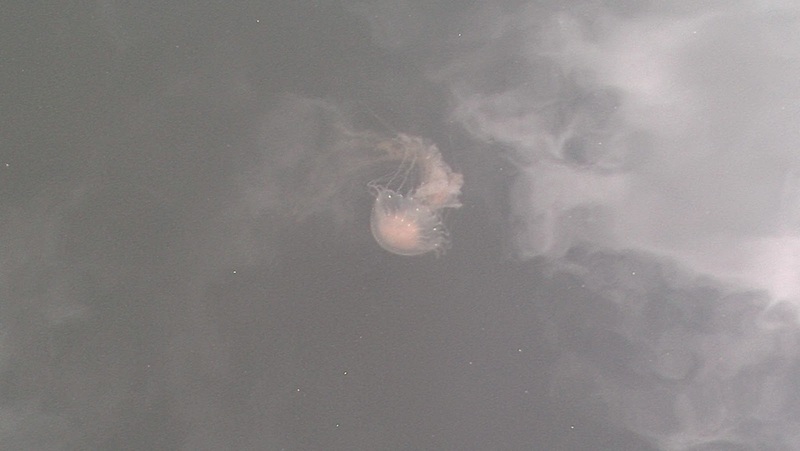 We did, however, see some jelly fish in the same basin near The Whistle Stop Cafe that we saw the last manatee in Saturday. Sunday began with a cool promise of lower temps, but that was just me hoping. We started off on our daily walk around 9:30 over to the Whistle Stop Cafe for coffee. The air was cooler, but that was mainly because we were taking our walk 90 minutes earlier than the day before. We made the walk over in about 35 minutes.....stopping for a few minutes to take a picture of one of the jelly fish we spotted. There was room on the outdoor patio at the Whistle Stop for us to sit this time, and since it was cooler we opted to sit out there under one of the market umbrellas sipping our coffee and just enjoying the morning. We really had no plans for the day other than taking our walk, and then staying cool the rest of the day. Around 4 pm we went inside Ernie and Carol's home for an early taco salad dinner, and to watch some NCAA mens' basketball.....Ohio(18) vs. Michigan State (4). We had guacamole, salsa, chips and a delicious taco salad prepared by Carol. It was a great game with Ohio upsetting Michigan State. We retired back to our coach around 7 and TLE read while I watched a movie I haven't watched in a long time....Bullit, with Steve McQueen. The chase scene between McQueen in a 1968 Mustang, and a 1968 Dodge Charger is a classic! Most days I can come up with a clever title for my daily blog entry, but for some reason nothing clever comes to mind for Saturday. After taking care of Friday's entry, and draining the gray tank into our host's sewer cleanout (real glamorous stuff to be sure) TLE and I took a walk into Port Salerno to have a glass of ice tea at the Whistle Stop Cafe. It's a nice destination for a walk because it is around 1.6 miles each way.....very similar to walking into Cedar Key from Sunset Isle RV Park. 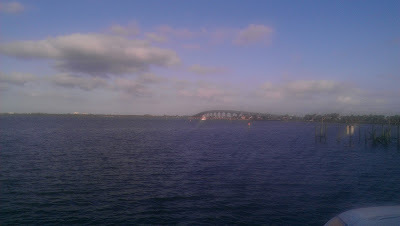 Since we are only a few blocks from the ocean the area is riven with canals, marinas, boatyards, basins, and waterways. 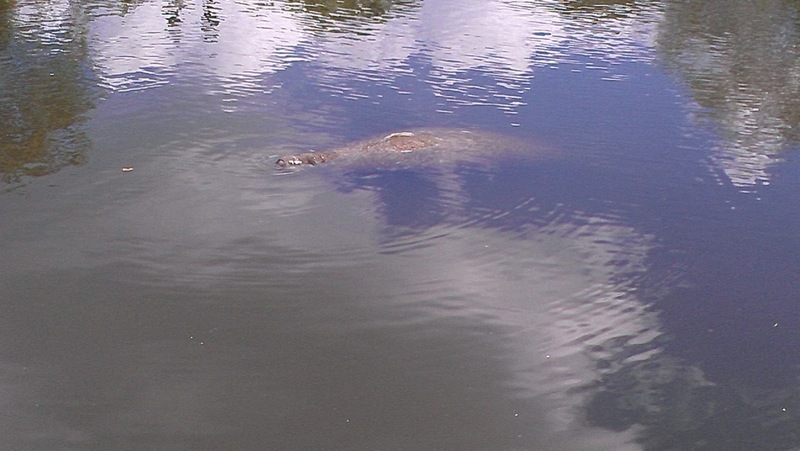 The interesting thing about the area around Stuart is that every single day we take a walk, or a drive we have have multiple manatee sightings. When we went to the places up north where some of the remote springs are actually named for the manatee (Manatee Springs for instance) we saw nary a one. However, here in the middle of suburbia we see them every day of the week, and twice on Sunday.......Saturday was no exception. Saturday is part of a 4 day stretch where the temps are getting into the mid to high 80's, it is overcast, and the humidity is a little higher. Needless to day, by the time we returned home we were both ready to "cool" down a little, so I turned on the front AC, and put a movie in the DVD player......HARVEY.....starring Jimmy Stewart. Haven't watched it for years, but enjoyed seeing it again. If you enjoy some of the old black and white movies you will like this one....very well written. We really had no big plans for Saturday so while Ernie was at a martial arts class TLE and I took a drive in search of the local thrift stores, of which, we discovered, there are many, many, many. We only got through 4 of them, and there are least a half dozen more. I picked up another t-shirt and a pair of board shorts. TLE picked up a pair of shorts, 3 sleeveless wicking shirts, and one t-shirt......total cost for all of our acquisitions was around $12. Carol comes home from her job up in Vero Beach Saturday evenings so we wanted to have a nice dinner with she and Ernie. We stopped by "The Fresh Market" and picked up some Copper River Salmon to BBQ. Around 6 pm we adjourned to the upper deck area above the "Paradise Club" (the name Ernie has given to his screened in patio,which does resemble a "tiki bar") to watch the sun set.....it was quite cloudy, but we were able to catch the sun right at the end peeking out under the cloud cover. Not long after this we had about a 20 minute down pour. We had a lovely dinner....the salmon steaks came out perfectly.....and of course they did...I was the "grill master". I can still hear Vin Scully calling "SWUNG ON AND MISSED.....A PERFECT GAME" as Harvey Keen struck out swinging to end the perfect game pitched by Sandy Koufax at Dodger Statium on September 9, 1965, 9:46 pm. Koufax struck out the last 6 batters he faced to earn the no hitter. When I listened to the YouTube video below just a few minutes ago I got goose bumps on my arms just like I did 48 years ago.....by the way September 9th is also TLE's birth date.....we would meet for the first time just 27 months later. Friday our plan was to drive up to Vero Beach with Ernie to have dinner with his wife Carol after she got off work. Last year when we were here we didn't have time to visit Vero Beach where the L.A. Dodgers used to have their spring training facility. 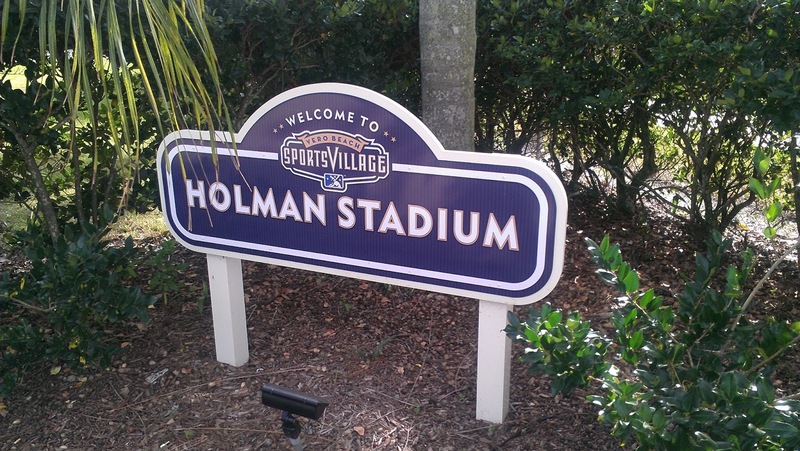 I used to listen to spring training games, and sometimes back then, on the weekends, they would televise some of the games played in Holman Stadium at Dodgertown. Regrettably, in 2008, after 60 consecutive summers the prior owners of the Dodgers sold this facility and moved their spring training facilities to Arizona. We left around 1 pm to drive Indian River Road up to Vero Beach. Along the way we took a break in Ft. Pierce to walk around the waterfront area. We were lucky to catch one manatee surfacing for air as we walked along the marina. We arrived at Dodgertown around 2:30 and went directly to Holman Stadium to take a few pictures of the place where the "Boys of Summer" came every February to prepare for the upcoming season. The air was heavy with memories of summers long past......it took me a long time to get here, but I did. We moved over to old town Vero Beach to find a place to get a drink, and a snack and found this cool hangout......a sign on the door reads "the last of the great American hangouts".......it is a funky, cool place......just the kind of place we like. We were able to get a table between the pool and the ocean.....what a nice couple of hours! They have a brown lager called "Waldo's Lager" on tap that really hit the spot! Around 6 we drove over to meet Carol, and then head over to River Front Chill and Grill in Sebastian....about 15 miles away. Yelp gives this restaurant a 4.5 out of 5 star rating. I had the Ahi fish tacos, which were truly amazing....in fact Ernie, Carol and I had them...TLE had the Mahi special, which she also loved. I would agree with the rating for the food, but the ambiance left something to be desired.......very noisy, and almost impossible to carry on a conversation. Stop Whistling and Start Shooting! Stuart, FL is the second place we have chosen to revisit on our almost 13 month odyssey. We were here the first 10 days of April last year visiting our good friends Ernie and Carol. I've known Ernie since high school, and TLE has known him since college. We had a great time last year, which is why we have made a stopover on our way up the eastern seaboard. One of our favorite breakfast places from last year is The Whistle Stop Cafe, which is just a 1.5 mile walk from Ernie's home. Last year TLE and I would not even have considered walking that far to eat.......but then there was the Amazon.com incident which changed our perspective on walking forever. When you average 10-12 miles per shift 1.5 seems like child's play, and really, it is.......at our pace it is about 25-30 minutes of walking. When we said "goodnight" to Ernie the night before we agreed to walk together over to The Whistle Stop for breakfast. About the time we were ready to leave for our walk Ernie got a business call, so he said to take off and he would catch up in his van. Since last year The Whistle Stop Cafe has undergone a transformation....they have expanded both their indoor and outdoor eating areas. It's is always great to see local eateries that you love flourish and expand. As usual the food and service were excellent. During breakfast Ernie, TLE and I were talking about self defense. This has been an ongoing concern of ours as we move from place to place, often overnighting in Walmart, Lowe's, or Cracker Barrel parking lots. To date we have had no incidents, but if something does happen we want to be prepared. Right now we keep a 7 iron golf club near the door, as well as an 18" long Mag Lite flashlight.....very handy as a club. Of course, these are only effective against someone who does not have a gun. A number of our full time friends.......not a majority by any means, carry some fire power with them on their journeys. I posted yesterday about a gun we are interested in, "The Judge" made by Taurus International, which fires 410 gauge shotgun shells. Since our area of defense would be primarily inside our coach against intruders we want something that is easy to wield in tight spaces, and will STOP an intruder in their tracks. We're talking about 5-10 feet maximum range inside the coach. When TLE and I were first married we owned a .22 caliber Remington semi auto rifle, and a 12 gauge Smith and Wesson pump action shotgun. We used to "plink" around with them in the desert up by Lake Isabella, CA where we tent camped back in the 70's. 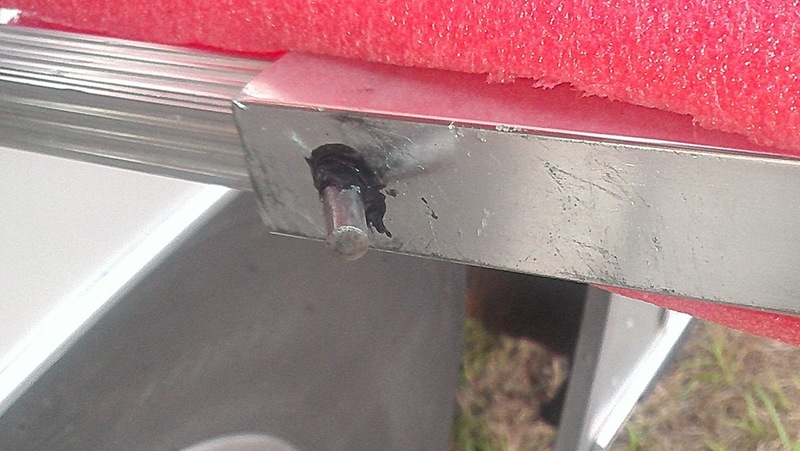 We also had a clay pigeon launcher which we mounted on the spare tire of the van we had and both shot hundreds of shotgun rounds over the years. Until Thursday I had never seen TLE shoot a handgun of any type. Ernie suggested that we visit the nearby Stuart Shooting Center (indoor facility) and test fire one there. They have guns you can rent, so we got in his van and drove over a few blocks and did just that! TLE and I both took turns in the firing lane with Ernie test firing The Judge. It does have a kick, and is very loud, but I think this is good option for our particular situation....easy to store inside the coach, easy to put into action quickly. We'll continue our research and hopefully over the next few months make a decision on what works best for our situation. We each also test fired a Beretta .22 caliber that takes .22 long rifle cartridges. TLE actually did quite good with both pistols....she even hit the bulls eye with the Beretta, and she was able to handle the "kick" of The Judge just fine. By the time we finished our shooting range session it was after 3:30 and we decided to head over to Conchy Joe's Seafood Reataurant in Jensen Beach.....another place we went to last year, and really liked. We sat near an open window sipping good beer, and munching on some appetizers for an hour, or so. Another nice day with new adventures in the books! The rain continued most of Tuesday night into Wednesday early morning. By the time we awoke the sun was beginning to poke its sunny head out from behind the clouds. Naturally, the humidity was high as the water that fell from the sky began to evaporate back into the air. Wednesday was a LOOOOONG travel day....almost 66 miles......:D We didn't plan to leave until after 10 am as our friend Ernie would not be home from a class until after 11:30. 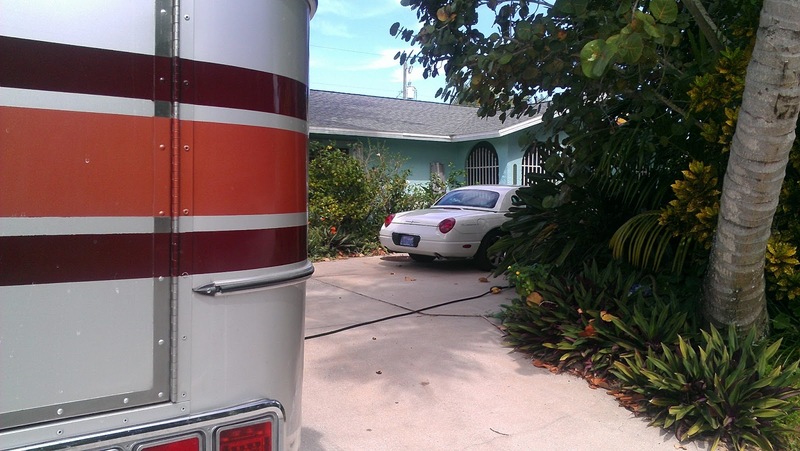 This is our second time to Ernie and Carol's home in Stuart, FL. We were here the end of March last year for about 10 days. The drive up I-95 was smooth, and uneventful....we drove with the windows open in front.....nice cool breeze, and not too humid. We arrived at Ernie's at 11:45, dropped the trailer directly across the street from his home, and were in the process of getting ready to park the coach in the driveway when Ernie arrived home from his class. Last year we parked the trailer on the opposite from where the coach is, which required the use of a neighbor's vehicle to back it in. Parking the trailer across the street is something I could do with the coach, and will make leaving next week all that easier. While I finished getting us plugged in, and the water hooked up, TLE sat in the garage talking with Ernie, munching on some of her famous salsa and chips. Last year when we arrived I provided Ernie with a 30 amp box which his neighbor installed while we positioned the trailer and coach. Nice to have that box already in place this year......and it still works! I could never get the DirecTV signal.....we were able to get it last year in this spot, but the palm trees have grown, and I think one of them is blocking the signal now. Around 6:30 TLE prepared a nice salad, and we went in to have dinner with Ernie......Carol, Ernie's wife works up in Vero Beach during the week, and keeps an apartment up there. We'll see her on Saturday. We had a nice dinner out in the "Paradise Club" and then retired to the living room to watch American Idol at 8. Another development is we have been looking for a better means of self defense than a golf club, or heavy 18" MagLite flashlight. We're looking into acquiring a "Judge" revolver pistol, made by Taurus International Mfg. It holds five 3" 410 gauge shotgun shells. I think this is a much better solution than the short shotgun with pistol grip we had considered. Much easier to wield in confined places, but has the stopping power I am looking for. If all goes as planned we should leave Stuart better equipped to protect ourselves if the worst should ever happen. So far in over a year of being on the road we have never had a situation that required something like this, but we should be prepared......getting one after the fact will mean something bad has happened....better to take care of the preparation now, and not be sorry later. The answer is "YES" I did sleep like a baby Monday night.....the night before moving day. Getting better at not over analyzing what needs to be done the morning of moving day. Tuesday morning was much warmer, and much more humid than it had been the previous 3 days. Since we had not "deployed" too much equipment in the 5 days we had been at Jolly Roger Travel Park there was not as much to do. As you will recall, however, when we were put in our site the manager had to use his tractor to put our trailer in our site. For us to have done it would have taken a long time, and put small animals and children at risk. 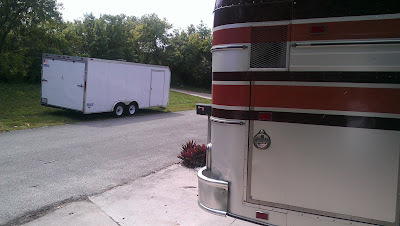 To refresh your minds, here is what we looked like (see above) in our site.....rather tight fit, huh? I kind of walked off the possibilities of how we would pull out, hook up the trailer, and load the car without needing assistance again. I took time to explain to TLE my plan and she gave it a thumbs up. Here it is.....first move the car out of the site. Second, pull the coach out of the site, do a 3 point turn so I end up to the right of the trailer. Three, back up to the trailer and drop the tongue on the hitch. Four, attach the anti-sway and leveling bars. Five, load the 'Bird. Well, imagine this.....it went exactly as planned! The most difficult part of the morning ended up being us trying to merge 62 feet of coach and trailer into northbound traffic on Highway 1.......there are just tooooo many people out here on the Keys! Okay, that our plan to extricate ourselves from site 65 went sooo smoothly was the "High" of the day. Northbound traffic at 11:45 (our departure time) was heavy all the way back to the mainland. Most of the time the speed limit was 45 mph, and once and a while it would get up to 55 mph, but we were rarely ever able to achieve the allowable limit. 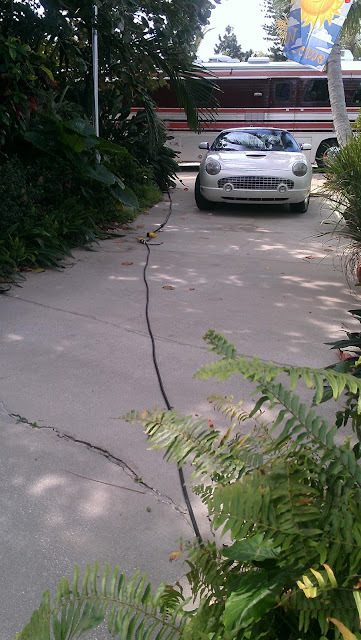 One thing I did learn is that my "fix" to the cruise control cable is working like a charm.....I was even able to set it at 45 mph and it held! It took close to 90 minutes to reach the entrance of the 821 Expressway......expressway is a euphemism for "this freeway will cost you money to drive on". Most of the tolls Tuesday were the "Bill by License Plate" type....we've probably wracked up $30 in those tolls in the past 10 days.....that bill will come due later. We shelled out around $5.00 out of pocket. All in all the drive on the "expressways" was very smooth, with very low traffic volume. We did have to exit the expressway once for about 2 miles because of a bad accident, but there were multiple signs warning us of what was coming and we just exited one exit before the accident, went around it and got back on the "expressway". Our goal for the day was Boca Raton.....about 143 miles from our starting point. TLE has a friend from her workaday life back in California that now lives in Boca Raton, and they both really wanted to get together. I had spent part of Monday evening, and Tuesday morning checking out possible campgrounds in the area.....the ones who had availability didn't have a site long enough for us, and I didn't want to unhook the trailer for one night. The ones that had large pull throughs were booked until the "12th of never", so I asked TLE to work her magic and find us a dry camp spot for the night. Most of the Walmarts on the east coast of Florida, along the I-95 corridor, do not allow overnight parking. The Cracker Barrels parking lots were too small. Finally she came up with a Lowe's Home Improvement Center right in Boca Raton. We've never stayed at a Lowe's before, so I was a little nervous about whether they would let us stay over night. 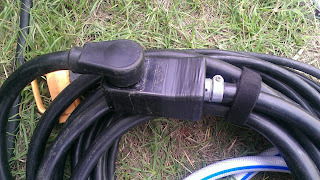 They, however, do provide excellent guest WiFi (which I am using to write this blog entry). Here is what our "safe neighborhood" looks like this morning.......it did rain quite a bit last night so there is a lot of moisture in the air still......like 100% humidity! 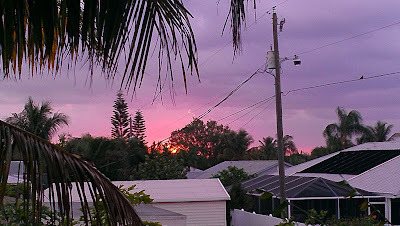 Around 5 pm we got in the car and drove about 7 miles to Lilliana and Todd's Boca Raton home. It has been about 5 years since Lilliana and Elaine have seen each other so there was lots of serial hugging going on. They took us to a Cuban restaurant called "Little Havana" in Deerfield Beach. I had the Palamillo Steak, and TLE had the Rebozado (fish)....both were excellent. Both dishes came with a bowl of black beans (yummy) and a bowl of yucca....I have never had yucca before, but it was very good. We got back to our "home" around 8:30. I had some insurance work to attend to.....with the 3 hour time difference between east and west coasts I often get e-mails around 8 pm east coast time, but just at the end of business on the west coast. After that was taken care of we settled in to watch a few recorded shows. We fell asleep with the windows open, listening to the rain on the aluminum roof, and smelling the scent of fresh rain on the surrounding vegetation.....what a great way to fall asleep! Wednesday will find us back in Stuart courtesy parking at our friend Ernie's home again....you will recall we were here 11 months ago near the end of March for about 10 days. It promises to be much cooler this time since we are here over a month earlier than last time. Every once and a while we take a break from all the exciting stuff this nomadic lifestyle entails, and just take care of unexciting stuff at "home". Just like any sticks and bricks home, our "home" requires that chores be done, and small repairs be accomplished before they become bigger chores and bigger repairs. 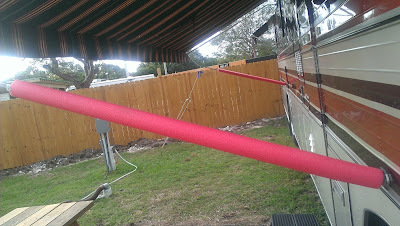 4) Fix the small post on the Zip Dee Awning that the support arm hooks on to when the awning is up. It came loose a long time ago and needed to be epoxied before it fell out and was lost forever. I have been living on borrowed time for a few years on this one. Near the time I was finishing the last of these small repairs and upgrades (pool noodles) I got an instant message from Maria and Brian (Roaming Pint) asking if I was still interested in checking out some of their electrical issues in their Class C....specifically why some interior lighting was not working.....which was about half their 12 volt lights in the main living area. We agreed to meet them at the Home Depot in town around 4 pm.....a good place to be if electrical supplies are needed to complete repairs. Now tell me straight.....wouldn't you like to be able to take your house to Home Depot when you are trying to fix something? Think of how many times you have made multiple trips to HD trying to fix something that should take 5 minutes.......if you only had the correct "thing" to fix it with? Usually in these rolling homes the problem with any 12 volt accessory is one of two things.....power supply, or ground.....more often than not it is the ground that has become corrupted, loose, or disconnected completely. This is the result of living in a home that moves, vibrates, shakes, rattles and rolls down the road....stuff comes lose. When I got our first motorhome (also a Class C) I had to teach myself to troubleshoot both 12 volt issues (direct current), but also 110 issues (alternating current). 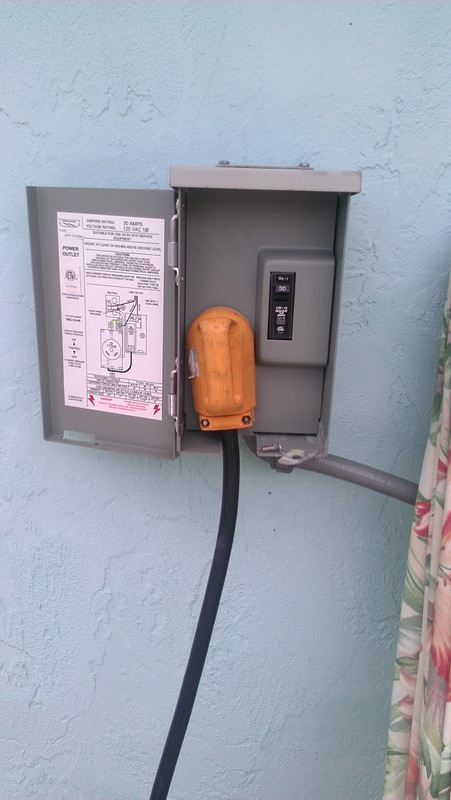 My knowledge base is still pretty thin when it comes to electricity, but I have become pretty competent at troubleshooting 12 volt issues. We arrived at Home Depot a little after 4 to find Brian, Maria and "Stanley" (the name they have given their Class C motorhome) awaiting us. I got out my tool bag and went inside with TLE......while Brian and I tended to checking their various light fixtures, TLE and Maria chatted in the back room occasionally shouting out words of encouragement. There were about 5 light fixtures that were either not working at all, or working intermittently. The largest one turned out to have a bad connection on the ground wire, so we just replaced that. The second one had both a disconnected ground wire, and a burnt out bulb. The last three just had burnt out halogen bulbs, which HD carries, and which the ladies made a quick walk into HD to acquire. Time goes fast when you're having fun, and before we knew it 6 pm had arrived. Brian and Maria offered to treat us to dinner for our help fixing their lights, and for the work I did on their bikes in Cedar Key a few weeks ago....cool! 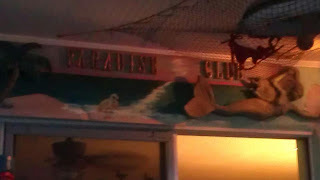 So we headed over to Island Fish Company (the place we had breakfast a few days ago) for dinner. The food was delicious, and the conversation flowed. TLE and I split a Broiled Hogfish with Bearnaise sauce, stuffed shrimp, broccoli and asparagus......amazing seasoning, and the veggies were cooked to perfection. We first met Brian and Maria almost a year ago on our first pass through Cedar Key....at that time they were just a year, or so, into their nomadic journey, and still learning how to live on the road. Now they are experts at street camping (I call it stealth camping) in big and small cities where often city ordinances prohibit it. They both have full time jobs they do on the road in the graphic design field, and are both younger than our two oldest children. That's the interesting thing.......we think of them as peers....as equals. They are both very bright, mature, outgoing, interesting young people with a strong work ethic, and a desire to life unfettered by the more traditional life they were living just a little over two years ago. They bought Stanley only intending to travel for six months....after just 2 weeks they decided they would not go back to their "traditional life" and just keep on moving. Like us, they will be heading back to the "mainland" Tuesday...they will stop in Miami and then head back up to Cedar Key for a week, and then.....who knows....we nomads don't like to plan too far ahead. Tuesday is moving day.......thanks for stopping by! You know how sometimes your expectations about a place get built up over time, and when you finally visit "that place" it just does not quite live up to expectations, let alone your own hype? Well, I've been thinking about Key West for most of the last 12 months knowing that at some point in 2013 we would be here. It is one of those places that has always had a certain mystique to me......Ernest Hemingway called it home for 11 years back in the 30's.....and that is probably when it was at its best. 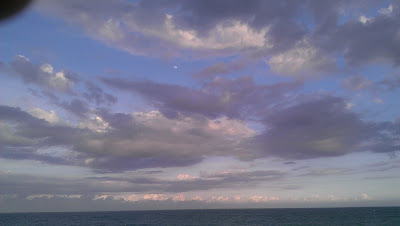 It was a remote island arrived at by boat.....now it is connected by the Overseas Highway which feeds thousands of vehicles a day into its downtown, has a large airport where jets take off and land all day, and cruise ships make frequent stops......it is no longer a remote oasis. The Key West with which Ernest and Pauline Hemingway fell in love in the 30's no longer exists......it has become a caricature of itself. Today, Sunday, February 17th, 2013, it is a crowded tourist trap......today it is wall to wall people.....you have to walk sideways to go down the street. If you get out on the "edges" of the town you can still feel its charm.....you can look across the Caribbean and see nothing but emerald colored water to the giant horizon.......like the picture below, but walking down Duval, Whitehead, Caroline, or Emma streets it is hard to imagine why anyone would want to spend much time here today. The restaurants, hotels, museums and gift shops, which make up 99% of the downtown businesses are just overflowing with people who seem to spill out on to every sidewalk. All that being said, we weren't spending the rest of our lives in Key West, or even 10 days in Key West.....just 5 hours. Am I saying don't go to Key West....no....you should go at least once if only to say "you were there". We finally got ourselves in gear around 9:30 and headed southwest on the Overseas Highway (aka: Highway 1) to Key West. It is only 52 miles distant from the Jolly Roger Travel Park, but it takes around 90 minutes to get there. We arrived around 11, found parking in the Westin Hotel parking structure for $4/hour....there goes $20 and we haven't even exited the parking structure yet. Our first stop was "Mel Fisher's Treasure" Museum......a friend, who is an investor, called me a few days ago and said he could get us free passes to the museum, so we picked up our "will call" tickets and began the self guided tour of the museum (thank you Tom and Nancy!). Mel Fisher's Treasure is actually a pretty cool place. In 1985 after 16 years of searching Mel and his treasure hunters found a Spanish galleon named the Atocha, and over 40 tons of silver and gold worth in excess of $450 million dollars! It was very interesting to see jewelry and other things that had been underwater for 100's of years and still looked beautiful. The Lovely Elaine surrounded by objects of beauty. Afterwards we walked a block over to the dock area where large cruise ships "park" while their guests flood Duval Street, and all of the surrounding streets.....too many people in a small place reminds me of Disneyland on a holiday weekend in the middle of the summer, except the temperature was hovering around 59.....brrr! From there we walked off in search of a place to eat lunch......every restaurant, pub, bar and dive was packed full of people. We walked up and down Duval, Caroline, Whithead, Front, Southard searching in vain. We finally settled on the Hog's Breath Saloon just off Duval Street....the only two seats available were at the bar.....their beer selection was meager, but at least it was draft.....I had a Blue Moon Belgian White, and TLE had a seasonal Samuel Adams. For eating I had the Black and Bleu Burger. 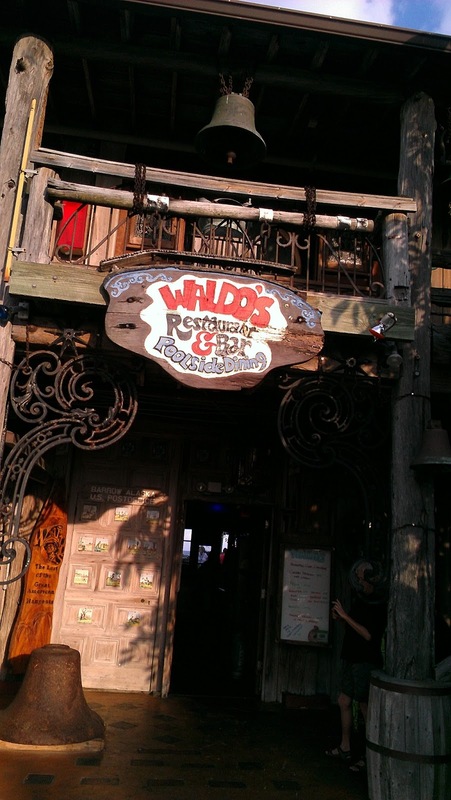 The food service was very, very slow, which is understandable (still not acceptable) since half the population of the free world was in Key West Sunday afternoon trying to get lunch! After lunch we walked over to the Harry S. Truman Little "White House". Key West was a favorite vacation destination of President Truman......during his time in office he visited Key West at least 11 times. There was a tour that we could have paid $18 to take, but we chose to just see the "free" exhibits. Next up was the Key West Museum of Art and History which cost us $12 to tour, but was definitely worth the price of admission. After that we were pretty much done with our day in Key West....it was going on 4:30 and time to begin the 90 minute drive home. We paid the $20 ransom to get our car out of the parking garage and headed for home, arriving just in time to catch this amazing sunset! Visiting Key West made us appreciate the laid back, uncrowded 5 weeks we spent in Cedar Key.....it must be more like what Key West was back in the 30's, 40's and 50's.